To make the chutney ~ put all the chutney ingredients in a heavy pot and stir to combine well. Cover and set aside for a hour. Bring to a boil and boil the mixture for about 30 to 40 minutes, until reduced and thickened. You can test the mixture for doneness by dropping a bit on a very cold plate, it should jell as it cools. Ladle into clean jars until 1/2 inch from the top. Screw on the lids (not too tightly) and set the jars upside down to cool. Store the chutney in the refrigerator. Makes 3 half-pint jars that should last at least a month or more. 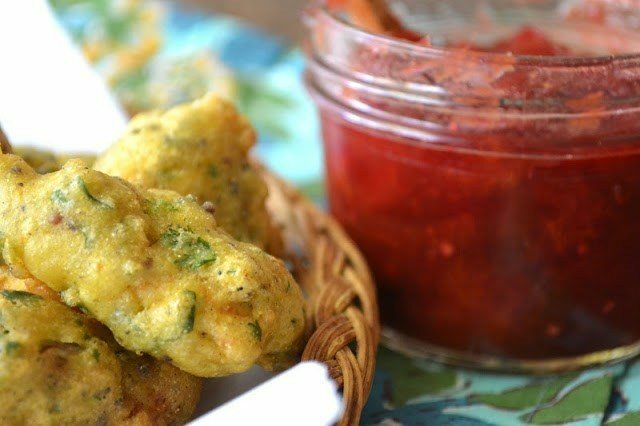 To make the pakorah ~ Put the chicken tenders in a bowl along with 1 tsp of the garam masala, the mustard seeds, hot pepper flakes, jalapeno, and citrus juices. Mix well and set aside to marinate for about an hour in the refrigerator. Mix the chickpea flour with the baking powder, garam masala, turmeric and salt. Add in the warm water until it forms a thick batter. It should be thick enough to coat the chicken without dripping off. Use more or less water as necessary. Put the chicken mixture into the batter and blend well. Heat about two inches of oil in a heavy pot until it reaches about 350F. Scoop out the coated pieces of chicken with tongs and drop into the hot oil. Fry a few pieces at a time, for about 2 to 3 minutes, depending on the size of your pieces. They should be golden and cooked through. You may have to cut one open at first to determine that they are fully cooked. Remember they will continue to cook a bit after they are out of the pan from the residual heat. Drain on a paper towel. Serve hot with chutney on the side.